Continuing our month’s worth of duet albums (ending on the weekend before Valentine’s Day), we listen today to the unlikely pairing of former Traffic guitarist/singer Dave Mason and Cass Elliott, of the Mamas and the Papas. 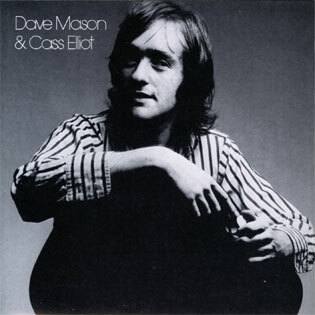 Released in 1971, Dave Mason & Cass Elliott serves as a followup to Mason’s solo debut, Alone Together (1970). Elliott had released a couple solo LPs in the late 1960s but when she cut this album with Mason the Mamas and the Papas were still an active group. Mason is, of course, the odd man out in Traffic, the guy who wrote such pop-rock classics as “Feelin’ Alright” and “Hole In My Shoe” to balance out the jazz-rock-blues influence of Steve Winwood. He co-founded the group, left after its first album, participated only in part of the recording of the second album, then the group broke up. Traffic re-formed in 1970 without Mason, because he was on his way as a solo artist. Mason was also known for appearing on recordings by other artists, such as Jimi Hendrix (“All Along The Watchtower”), George Harrison (All Things Must Pass) and Graham Nash-David Crosby (“Immigration Man”). Mason met Elliott through a mutual friend, and both artists sought out the collaborative atmosphere of recording with a group. Because it was originally planned as a Dave Mason solo work, Dave Mason & Cass Elliott isn’t really a true “duet” album – Mason writes most of the songs and sings most of the leads with Elliott merely chiming in with background vocals. She does get a few “spotlight” vocals, most notably “Here We Go Again,” which she wrote with Bryan Garo. Cass also co-wrote, with Mason, “Something To Make You Happy,” which would become the lead single off the album. This is a good example of the solid work that the era’s superstars excelled in. Relaxed without sounding forced, mellow without being too wimpy, Dave Mason & Cass Elliott is a class work from both artists. Mason wrote some of his best songs for this album, and Elliott’s unselfish work on vocals help produce a very listenable album. I’ve seen reviews that describe this as “bland and predictable,” which was the criticism for much of Mason’s later solo work, but I think Dave Mason & Cass Elliott is a nice, breezy 1970s West Coast middle-of-the-road rock album. Elliott would continue her solo career with more albums, television appearances and the occasional acting gig. In 1974, she had just performed a series of sold-out shows when she died in her sleep of a heart attack. She was 32. Mason would continue his solo career with moderate success, including the Top 20 hit “We Just Disagree” in 1977. He joined Fleetwood Mac briefly in the 1990s and continues to perform live shows and record sporadically today.